Loeliger-Myers and Finneron are members of the Dirty Girl Gardening Club in Killington, which was established 17 years ago. The club is mainly social in nature and welcomes all who love to garden and who do their own work in the dirt, Finneron explained. “We’re really just a group of gardening enthusiasts,” said Loeliger-Myers, who shies away from the term “club” because it sounds a bit exclusive, which they definitely are not, she said. While these women are enthusiastic gardeners, they are not running enthusiasts- mud or no mud. In fact, none of the club members has participated in an event like the Dirty Girl Mud Run previously. That being the case, four members and three honorary members will be participating in the event as a team this Saturday, July 11. “I don’t even run!” said Finneron, let alone attempt an obstacle race, but she is excited to do what she can and have a great time at it. Just like the Dirty Girl Gardening Club, “We always have a great time, that’s what it’s all about!” she said. At the Dirty Girl Mud Runs women don’t have to be fast, they just have to get dirty and remember that “dirt, is divine,” race organizers state. Celebrating its fifth year, the women-only, untimed 5k Dirty Girl Mud Run series encourages women of all ability levels around the nation to come together, fundraise for breast and ovarian cancer through Bright Pink (the national charity beneficiary), and most importantly, have fun. The event focuses on building camaraderie among women of all fitness levels and challenges participants to conquer fears. During the Dirty Girl Mud Run, women will run walk, climb, jump and laugh their way over obstacles. Dirty Girl has established itself as the premiere all-female mud run with 15 events throughout the county in 2015. While the dirty itself may be an obstacle for some women, that certainly will not be the case for the “original dirty girls” from the gardening club. Recently, club members showed just how unafraid the are of getting dirty, at the Killington Parade held July 4. Dressed in their bright pink Dirty Girl race t-shirts, their “costume” was a thick lathering of mud from head to toe. 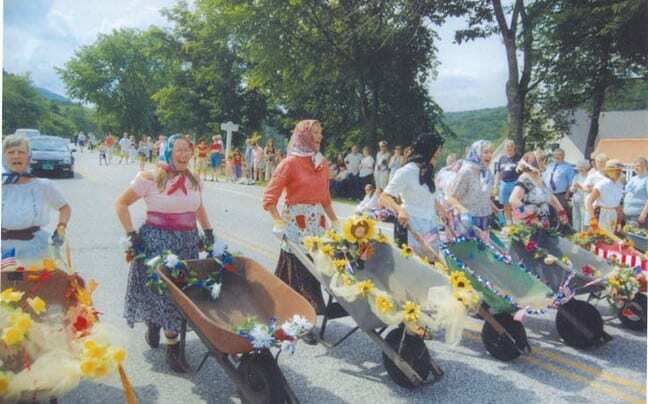 The parade is one of the main annual events for the Dirty Girl Gardening Club. They have participated since July 1999 and they are always the last to march, ending the show with a bang! Each year they have a unique theme usually with a choreographed routine by Loeliger-Myers. 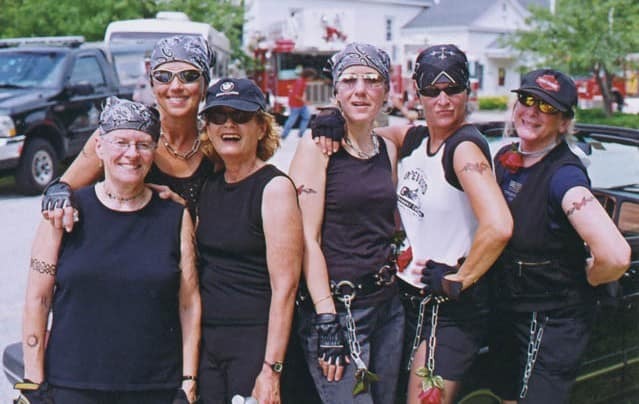 Finneron said two of her favorites were the “Born to be Wild-Flowers” routine (2006) and the “Wheelbarrow Polka” (2007). Others have included the “Rake Routine” (2000), “Hey/Hay” (2001), “Dirty Deeds Done Dirt Cheap” (2002), “Waltz of the Flowers” (2003), “The Watering Can-Can” (2004), “Hot, Hot, Hot” honoring the fire departments 50th anniversary (2005), “Bucket of Suds” (2008), “Who’s the Fairest” (2009), “Singing in the Rain” (2010), “Happy Birthday” Beatles version in celebration 250th anniversary since Killington was founded (2011), “Goodnight Irene” (2012), they did not participate in 2013, “Put a Little Love in Your Heart” (2014) and “The Original Dirty Girls” (2015). Dirty Girl gardeners participating in the mud run include: Barb Loeliger-Myers, Barb Foley, Sheila Finneron, Marcia Stoller and. Additionally, they have recruited three other women to join them: Sylvie Finer, Aja Barcomb and Kelly Ziegler. Dirty Girl gardeners who are not able to participate in the event Saturday, include: Sheila Pilsmaker, Sandi Simonds, Andrea Cupak, Nancy Mosher, Mary Hogstrom, Lisa Madigan, Lisa Unwin, Joan Wise, Louise Kenney and Pat Zack. The Dirty Girl gardeners encourage all gardening enthusiasts to join them. The Dirty Girl gardeners meet “sporadically,” talk about gardening and sometimes give presentations or visit garden centers or other clubs. Its first meeting in June 1998 was held at Finneron’s house and the topic was slugs. Other topics have included Japanese beatles, soil, compost piles, seeds, and pruning. Finneron and the Dirty Girl Gardening Club have also volunteered to help beautify local gardens including those at the “Little White Church” and at the Sherburne Memorial Library, among others. For more information about the Dirty Girl Mud Run, visit www.godirtygirl.com.